Minions and Miley and meth — oh, my! The Halloween costumes people are searching for the most online this year are full of pop culture references, from twerking to meth dealers and a reality show featuring a lot of hairy men, according to new data released Monday by Google to TODAY.com. However, the most popular outfit being searched for online has nothing to do with drugs or debauchery: It's the “minion” character from the animated “Despicable Me” movies. 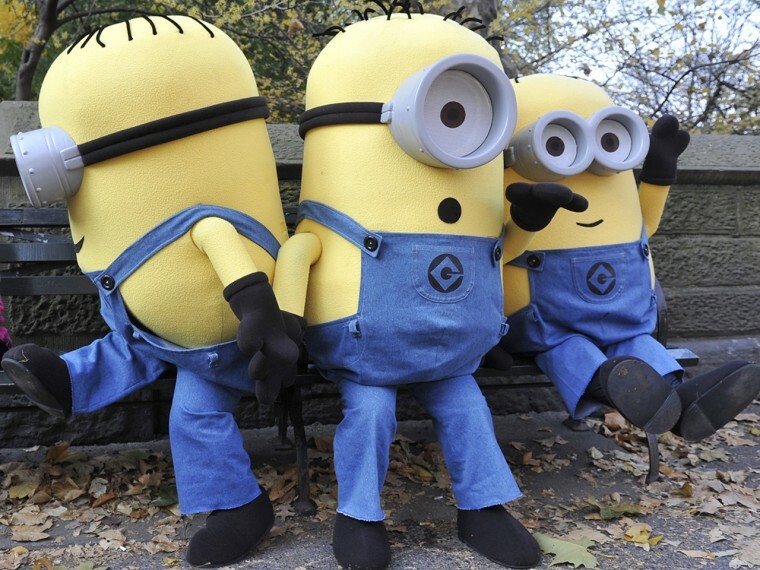 "Minion costume" topped a list of trending Halloween costumes on Google's search engine during the month of October this year. The “Miley Cyrus costume,” worn by the entertainer during her controversial performance on the MTV Video Music Awards show, came in second, followed by outfits for the television shows “Breaking Bad” and “Duck Dynasty.” Costumes for the "Great Gatsby," the classic American novel-turned-motion picture, were the fifth most-searched. Rounding out the top 10 Halloween outfits searched for on Google were costumes for wolves, Grumpy Cat, couples, DIY, and Gru, another "Despicable Me" character. Google Shopping showed similar trends, as well as additional top costume searches for Batman, the Minecraft video game and the "Game of Thrones" character, Daenerys. "Despicable Me" was also popular on YouTube, where it was the top most-searched do-it-yourself costume tutorial, followed closely by tutorials for how to look like a character from "Breaking Bad," and how to look like a fox (we're guessing this was inspired by the Ylvis hit song, "What Does the Fox Say?"). Americans are expected to spend $2.6 billion on Halloween costumes this year, according to a report released earlier this month by the National Retail Federation. Consumers will shell out $1.2 billion on adult costumes and an additional $1 billion of getups for children. Americans also are expected to spend about $330 million on costumes for their pets. According to the National Retail Federation, Americans plan to spend the most on more traditional trick-or-treating getups. More than 5.1 million people plan to dress up this year as a witch, the top costumes among adults, followed by a Batman character (2.9 million), vampire (2.7 million) and zombie (2.3 million). Princesses were the most popular children’s costume with 3.8 million, followed by an animal (2.8 million), Batman character (2.5 million) and then action hero (2.4 million). Pumpkins and hot dogs were the most popular costumes for pet, followed by cats and devils, the survey found.